Getting on for a year now since we met in Newport - I realise I didn't contact you afterwards to thank you for your hospitality. It was a very helpful day to me, and great fun too, so many thanks to you and your friends in Newport. I've done quite a lot since to get going with the RepRap printer and am keen to do more. I have finally achieved what I set out to do, which is to make some enclosures for electronics projects. Today the printing is stopped, as my extruder motor has mysteriously died on me, but I hope to be up and running again soon, and would like to build a Mendel Max style printer eventually. The year has flown by, and I hope that we can meet up again before too long! Thanks for the email, good to hear from you. Yes time is flying by. Great to hear your printer is making the boxes, covers etc. you need. I am still very busy with my various hobbies; I have just started my third 3d printer, each running better and more accuractly than the older one. I am also enjoying building other objects from the 3d parts I have printed. 3D printing is a great hobby in its own right. Anyone else up for it? It would be great to see how the various numbers have progressed with their projects etc. 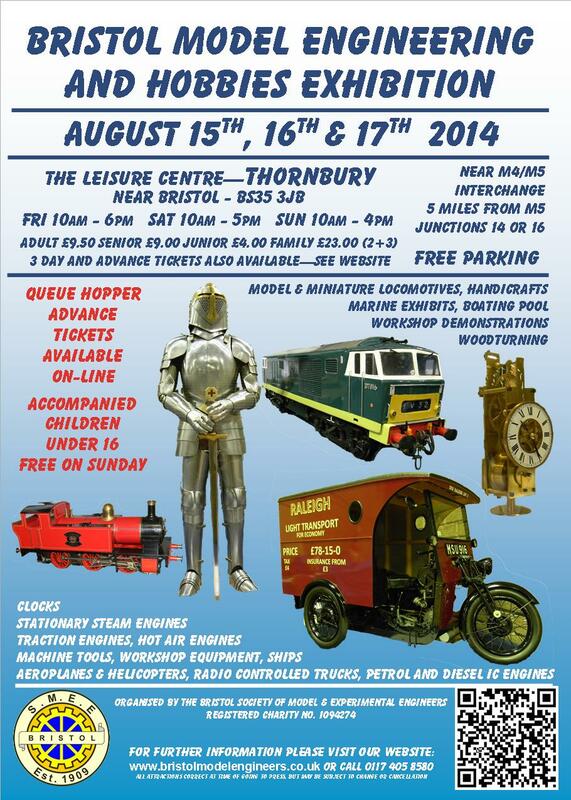 Will be at the Bristol Model Engineering and Hobby Show at the Leisure centre Thornbury BS35 3JB this Saturday. Are you going! I'm reading this on Sunday so I guess I won't be going to the show - sounds good though. So we need a critical mass of people interested to make for a worthwhile meet...say ten people? A Sunday meet up sounds good to me, no clash with work usually. Hi. Hope you enjoyed the show Paul. I am the Exhibition Manager for the Bristol Model Engineering and Hobbies Exhibition and I am particularly interested in getting some 3D, RP (or is it now called AM?) demonstrations at this year's show. The Thames Valley group organised a section at the Sandown Park event recently and it would be good if the WoE group could do something similar at our event. I don't know anything about the group yet but I am sure I will do shortly. Are there any regular meetings? If so, where are they held? I am building 5" gauge railway items including an electric loco at the moment and am particularly interested in learning more about 3D printers, etc. to make parts for it and other projects. I look forward to hearing from anyone who can help with a presence at this year's exhibition. Hi. I am a new boy to this forum so please forgive me if I am in the wrong place. Having spent many happy days at the Bristol Model Engineering and Hobbies Exhibition over the years and look forward to many more. My problem is at the age of 70 getting about is now becoming a problem, so I have found this new toy my computer it has opened a whole new experience for me. For many years I have been interested in engineering and making things. As you get on in years the old joints get stiff, however, the mind still has to be kept active. This is why I started looking for a new hobby that I could do that allowed me produce many items of interest and that used the skills gained over many years along with all the new ones that can be found inside my new toy. Yes my computer. 3D printing is the vehicle that I hope will allow me to continue designing and making them albeit in a new medium. I have purchases a Heacent 3D Prusa Mendel and built it as far as I can . Now I need HELP moving on. I want to meet up with like minded fellows that can help me. If anyone think's they would like to help this Old Chap then you can contact me at tinkering@yacht-xanadu.co.uk and I look forward to hearing from you. There doesn't seem to be much group activity in the Bristol area, or indeed any at all ! I have a RepRapPro 3 colour Legacy Mendel just upgraded to a tricolour Mendel, and live just outside South Bristol. I would be happy to meet up with you, and talk 3D. Maybe we could get something going to support Steamy Steve at the Bristol Engineering and Hobbies show. Send me a Private message if you like [PM] at the top of the post. Hope you enjoy your printing - it has it's frustrations just like any printer, but its a joy to watch. If you are stuck in the house then it sure beats watching goldfish! I'm wondering if you have any news on whether some of you guys would like to show what 3D printing is all about at our Bristol Model Engineering and Hobbies Exhibition, as you suggest in your message to Tinkering. Thanks for your offer. I am still trying to get several others interested but if you know any other Reprapers who could join you that would be great. I am also trying to get some suppliers to come along with their 3D Printing products. Keep in touch. I'm in north Bristol and have a Kossel Mini that is still in the teething stages right now but might be worth showing off by August... and, errr, Hi! Hi Robin. Thanks for your interest. I am planning to have a Reprap stand at the BSMEE exhibition but I would ask if between you, that is 'Tinkering', 'Core Storage', 'Paul2d3d' and you, 'Zedsquared' and any others, would organise yourselves so that I would have one contact point for ongoing communications, please. I look forward to hearing from you - I will keep in touch too. Regards, Steve. Thank you Steve for the exhibition flyer, I will be there. I am happy to take my RepRap Tricolour Mendel along and help on a stand, although I'm not really sure what things we should attempt to print by way of a demo during the show. I would think they need to be items that will print reasonably quickly and that will hopefully strike a chord with the model engineering types that will be there. Maybe Steve can suggest something - reasonably small, that might be needed by modellers, and ideally difficult to make by other means. My introduction to 3D printing was at a talk given by Adrian Bowyer when he printed a whistle - that was a simple item but it certainly won me over. I never heard from Tinkering, I will send an email to the address he gave. Otherwise with Steve organising the show and Paul on his club stand from Newport it looks as though we will need some input from a few more people to make it work. I'm up for a meeting in a pub one evening to discuss it - I live to the South of Bristol in the Chew valley, but I'm happy to meet anywhere in the greater Bristol area. Thanks for the responses. I am on holiday at the moment but will be back in touch next week on my return. I will then try to fix a meeting. Thank you all for your interest. The plan is to have a section to display and demonstrate 3D printers (& scanners, if possible) in a '3D Area'. We will provide a few tables, mains power, free refreshments, etc. over the three days. Set-up of the stand will be on Thursday, ready for the crowds arriving at 10.00 on Friday. I hope to have a 3D Printer supplier as a trade stand who will ideally be adjacent to you RapRep folk. I have attached a leaflet for the exhibition for your info. I would be happy to meet up with all you who have expressed interest in joining us, plus any others reading this thread. Those of you who have expressed interest so far are: Paul (2D3D), Corestorage (Andrew), Zedsquared (Robin) and possibly Tinkering (?). I am suggesting 3 possible dates for a get-together in a pub in North Bristol - Tuesday 15th July, Thursday 17th July, Tuesday 22nd July - at 7.30pm at the Willy Wicket, Downend - www.vintageinn.co.uk/thewillywicketdownend/ . It is off J1 of the M32, go left and it is on the right at the first roundabout on the Ring Road (A4174). Let me know if you can make it and which dates are NOT suitable. You can contact me by email - stevebirch7@btinternet.com - thanks. Thanks SteamySteve for the suggestions. I am happy with all three dates probably earlier is better. I have only heard from you and Paul2D3D (who will be at the show anyway) so I don't think a meeting is necessary. However, I would like to talk to you so if you could please email me (see above) with your phone number and I will call you. Is there nobody out there who would like to set up a RepRap presence at SteamySteves show? I was rather hoping that we could have a group get together and plan some good things to print as demo pieces. Alas with no responses, and very little of my own time to devote to design work, it doesn't look as though its a runner. Sorry, I don't mind helping but I'm afraid I have no desire to be a sole evangelist.